Sorry if you thought this blog was all weather! I’m a fitness nerd and tech nerd. This means I am all about wearables and new tech! My first fitness wearable was the Jawbone Up, the first version a few years ago. Today I wanted to try out something new on the market, so I got the Microsoft Band. It’s a wearable that connects to your mobile device but also has a strong fitness component. I decided to take it right out for a spin running. after I customized it and set it up, etc. Let’s get right into the nitty gritty… BTW, there is a video just below you can checkout too! 1) Sync up with myfitnelsspal, runkeeper and others to track your runs. 2) Dashboard system online to gather detailed specs, as well as display on phone. 3) Wear it all day to track steps, heart rate, etc. 4) Get customized workout tips, exercises, etc. 5) Phone not required to be with you. 1) Even as tight as can be, the band seemed to have issues reading my heart rate while moving. Sitting still, it seemed okay, but obviously that doesn’t help. I found that it would be erratic. The heart rate would go take a while to catch up after I stopped running. My max HR was high, but the band couldn’t get a lock at that point, so it didn’t capture my heart rate till I slowed to a walk. 2) The GPS took a bit to lock, but this could have been my location, but I was in the wide open. One thing that sucked was I hit go and took off running, but realized after a while it couldn’t lock the GPS, so I lost a few minutes of data. 1) Access to Twitter/Facebook/Email/Text from your wrist. 2) Send pre made “quick replies” to messages/calls. 3) Calendar, phone notifications, etc. 1) No ability to reply with voice to emails/texts/Facebook/Twitter. 2) Small screen limits how easily you can view the above. 3) No good way to get notifications from other apps such as Snapchat, Facebook groups, Pages, Instagram, etc… Note, you can turn these on, but then you also get “soft notifications” like when your phone GPS turns on, when you open your keyboard, take a screenshot etc. See the pictures below. If you’re getting serious about your fitness, you’re going to want really good heart rate monitoring. There is really no better way to do that than a chest strap. The optical sensors for the wrist seem so cool, but really, they are just not as effective. A difference of a couple hundred calories in a workout is a big deal! That will quickly add up over a week. I really like my Zephyr HXM monitor. See the link to Amazon below. There are versions for Android and iOS, so make sure you get which one works for your phone. Pair this with your phone and use Endomondo, what I think is the best fitness monitor out there. 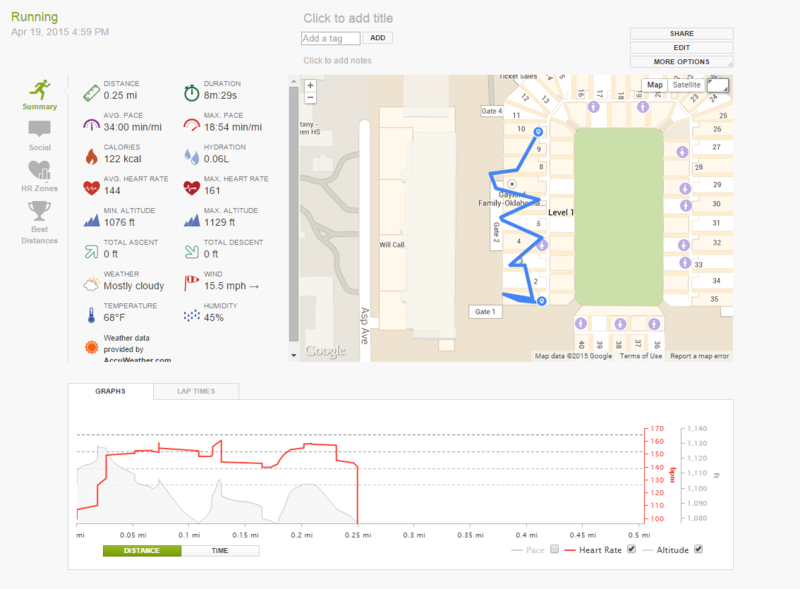 You can track your heart rate data, zones, all the distances, etc, it logs the weather data at the time of workout, etc. It has a lot of pre built in activities so you can record what type of workout you did. Also, this system easily integrates with MyFitnessPal so all your workouts get right into there. MyFitnessPal is a crazy great app. Scan in the barcode of everything you eat. Enter it manually if you want to weigh it out. Go to a restaurant and search for an entree (note, this obviously is not as accurate as weighing food out, etc, but it’s an estimate). Set goals, set a weight loss/gain plan, etc. Share data with friends, see what they eat, hold each other accountable, etc. Can’t say enough great things about it! I LOVE my Motorola 360. There are others out there, like the Apple watch, LG G Watch and more, but the 360 is very functional, customizable etc. I can put a Rolex face on it, I can put a sweet custom face on it.. Check out facerepo.com and look at all the awesome faces you can do! If you really want to know more about the 360 or Endomondo, let me know and I can try and do a video about them and all the features!